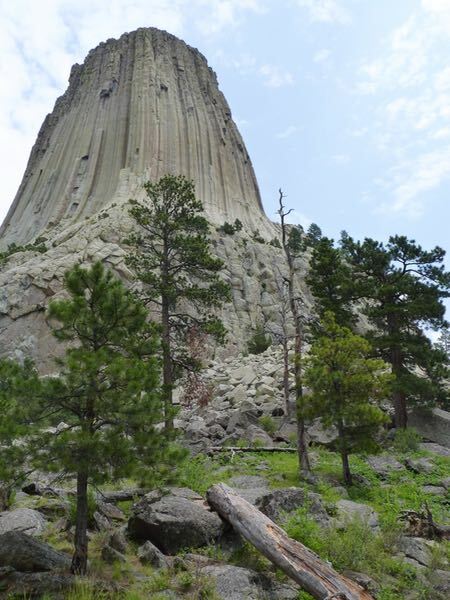 Devils Tower rises 1,280ft above the Belle Fourche River and can be seen for miles around. 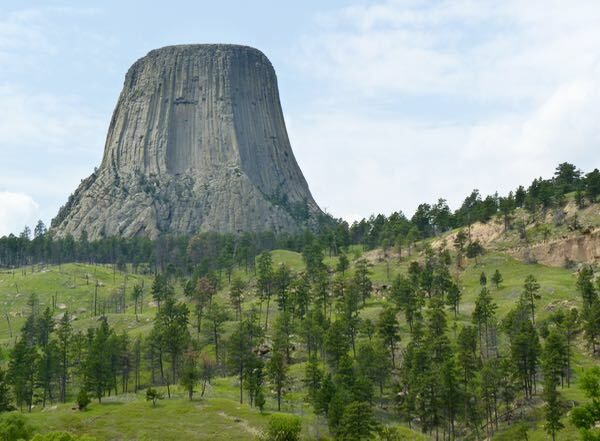 It was the first national monument established in 1906. Sacred to natives, and called by them Bear Lodge, or similar names. They have tried to have the name changed, as the current one implies traits opposite their traditions for the site. I walked the easy 1.3 mile loop trail that circled the tower with panels explaining the geology and surrounding vegetation. There were lots of rock piles at the base of the tower. Native prayer banners were seen hanging from branches, as many of them make a pilgrimage to the pillar to seek blessings and wisdom. 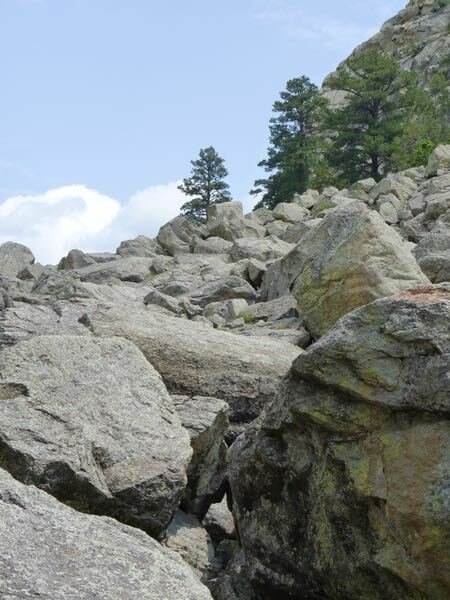 Rock climbers love the challenge of the steep walls. The first successful attempt being in 1893 by a local rancher. Several were trying their luck the day I was there. A prairie dog village, along the entry road, delighted visitors parked at every available spot to watch them. However, colorful red rock cliffs were what I noticed. 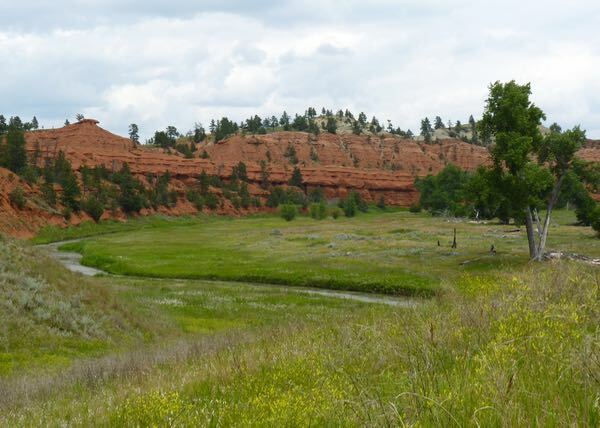 The surrounding area included the cliffs and the winding Belle Fourche River. I had planned to stay at the monument’s campground. 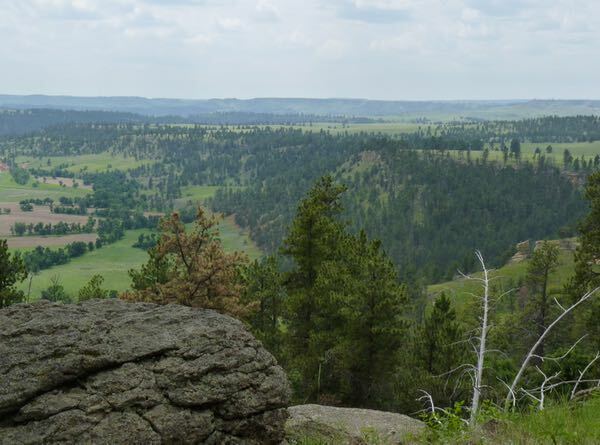 Instead, I decided to head for the Black Hills, and found a nice quiet boondock spot in the forest. What incredible places you have seen in this journey of yours. Did you get any pictures of the prayer flags? Yes, I’ve seen some great places while roaming around. No, I didn’t photograph them as I thought it inappropriate.